← When is the next Ice Age due ? 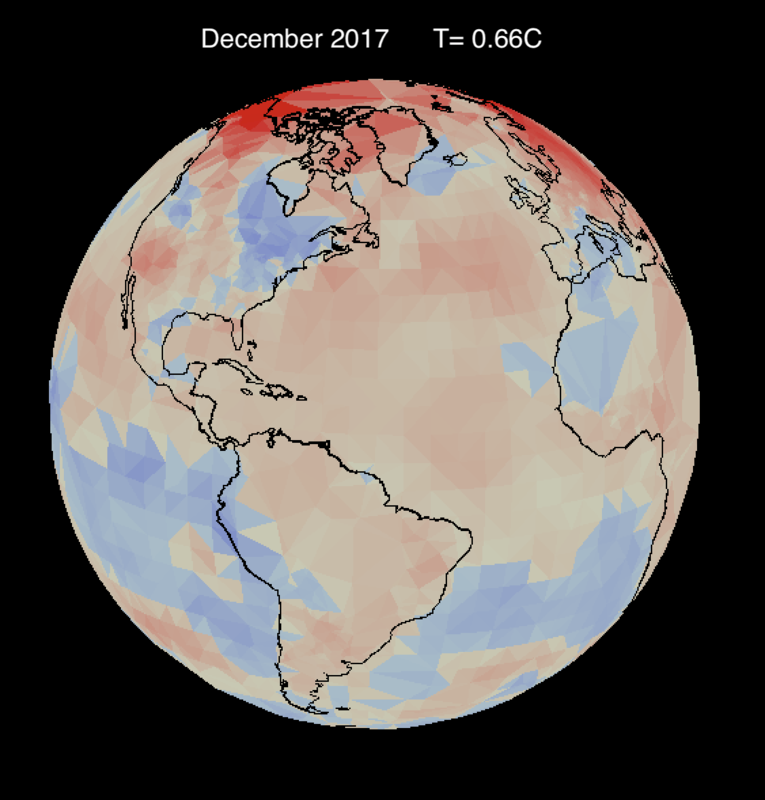 The December 2017 data for ocean temperatures (HADSST3) and station data (CRUTEM4) were released today. I calculate that December (0.66C) was slightly cooler than November (0.67C) and that the final 2017 annual temperature anomaly was 0.73C. 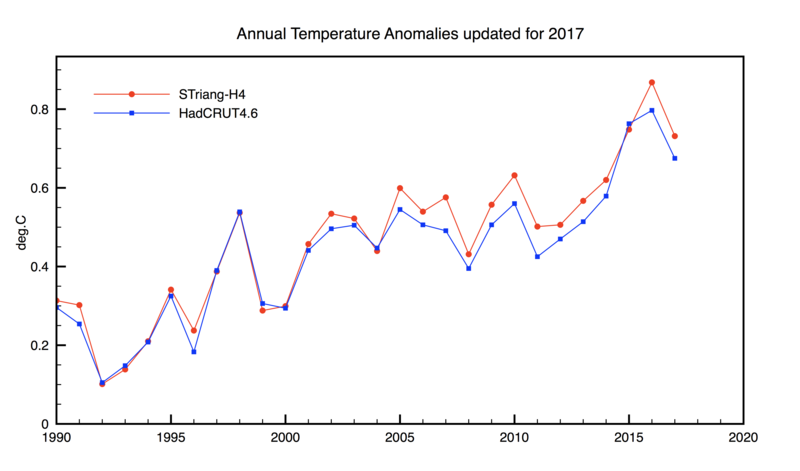 This makes 2017 the third warmest year, slightly cooler than 2015 (0.75C). This is how my results compare to the official HadCRUT4.6 results. I am using a 3D spherical triangulation. Here is the spatial distribution of December’s anomalies. This entry was posted in UK Met Office and tagged global warming. Bookmark the permalink. It might be the ‘3rd warmest year’ in the modern warm period, but there were various other warm periods before that. 3rd warmest year since the Little Ice Age ! Temperature varies from place to place, by day and by night, from season to season. How is it possible to get an average Temperature? Is this a useful measure? Just consider the simplest case of one place over one day and night. Temperature normally rises with the sun, increases to a maximum, and slowly cools during the evening and night. This particular place will be at the average temperature twice a day. Similarly, a broken clock will give the right time twice a day! When you consider a body as large and diverse as the Earth, an ‘average temperature’ may be about as useful as the broken clock. Remember that the UK Met Office no longer uses the term ‘average temperature’, instead it uses ‘global aggregate temperature’, a very vague term. Also, the highest ‘warming’ occurs in the high Arctic, where there are very few measuring stations. Further, the ‘global average temperature” has been ‘adjusted’ five times by 0.2 degrees C each, for a total of 1.0 degree C. Each time “they’ adjust it makes the present seem warmer than the past. Anybody care to reply ?